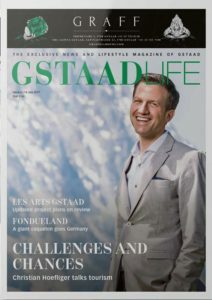 GstaadLife is the English news magazine in the Saanenland. It appears eight times per year and is seasonally focused. Four summer issues span June to August and four winter issues span December to February. The very first issue of was published in 2004. We were approached because there was a need in the non-German community and for visitors of the Saanenland to be able to read up on the goings-on in Gstaad. It’s a wonderful story because it goes to show how much they care about their chosen place of (temporary) residence. It keeps patrons, international guests, and travellers up-to-date about the latest news from the region, be it on economy, culture, or politics. It thus serves as an important link between the local community and our international guests. At the same time the magazine offers lifestyle topics and interviews with local and international people.